I’ve been using some salvaged wood to make repairs to the goat barn. One of the pieces seemed unusually light. I flipped it over and found a perfectly round hole on one side: the entranceway of a female Eastern carpenter bee, Xylocopa virginica. 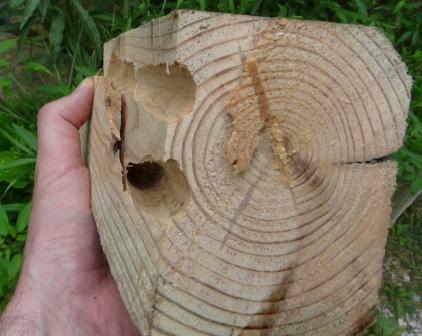 The bee that left this hole used her mandibles to gnaw into the wood, then she slowly tunneled through the timber. I’ve seen these bees at work on the rafters of several of the small barns that we’ve built for animals and hay. On a quiet day in early summer you can hear the crunching of chitin on wood as the bees make their slow progress. Below the holes, small piles of sawdust accumulate. I’ve seen many entrance holes, but never had the opportunity to see the extent of the tunnels inside. 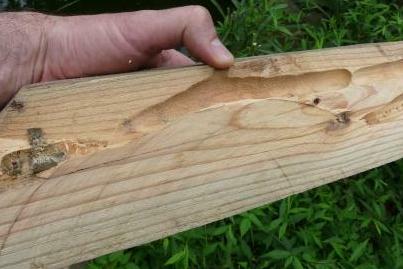 So I made a series of longitudinal cuts in my wood scrap, a 4×4 dissection of sorts. Inside, I found the tunnels extended about a foot away from the hole. One or two tunnels branched. This is an impressive hidden network, like a subway with just one exit. No wonder the piece of wood was so light. The bees make these tunnels for their young. The female makes a ball of pollen and nectar, then lays an egg. All this is sealed into the tunnel with a slug of compressed sawdust. Once the passage is sealed, the mother leaves her offspring to their fates. These futures sometimes involve woodpecker beaks. The drilling of these hungry birds will finish what the bees started. The two species, bee and bird, are an anti-carpentry team. But I also think of these animals as supreme carpenters: they’ve been making homes from wood for millions of years and they spend their lives happily sprinkled with the sawdust of their labor. So they are both über- and anti-carpenters. Away from wood, the bees do good work as pollinators. They are eager visitors to many species of flowering plant. Some farmers even erect pieces of wood to attract them into their orchards. I’m OK with a few at our place, but a year ago we had an invasion of battalions of barn-destroyers. So I relived my glory days of college squash-playing, dispatching them with a killer backhand from a dustpan. I felt bad, but not as bad as I would have had the barn needed rebuilding. These days we just have a few carpenter bees buzzing around and I leave them alone. This entry was posted in bumblebees, Garden, Insects, Trees on August 18, 2012 by David George Haskell. 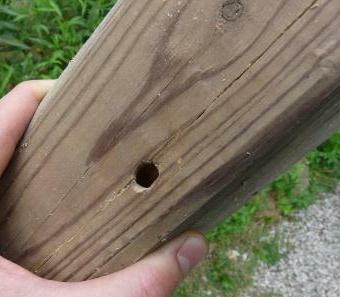 Carpenter bees are no joke! Those little creatures can sure do some damage. My backhand comes in the form of the plastic bat. I, too, feel bad about whacking them but not when they’re eating our newly constructed deck… And its better than pesticides, right?